Eva Baboula (D.Phil., Oxford, 2003) is an assistant professor at the Department of Art History & Visual Studies, University of Victoria. Her early work was on the use and exchange of metals in the Late Bronze Age of Crete and Cyprus. In the recent years her interests have turned to historical periods. She teaches mainly on the arts of the East Mediterranean from the Late Antique to the Late Medieval periods. 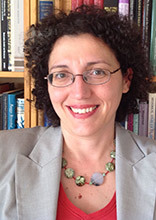 Her current research is centered on the study of: cross-cultural encounters in the Crusader and Late Byzantine periods; the urban topograhpy of southern Greece during the phase of Ottoman rule.